NEW YORK—An enjoyably old-fashioned musical is on display at Studio 54 in the Roundabout Theatre Company’s revival of “She Loves Me.” Based on a play by Miklos Laszlo, this marks the musical’s third time on Broadway. In 1934 Budapest, Georg Nowack (Zachary Levi) is in his 15th year of service as a clerk at Maraczek’s Parfumerie. Also on staff are his good friend, the older and married Ladislav (Michael McGrath); Ilona (Jane Krakowski) and Steven (Gavin Creel), fellow clerks who are having an affair; and Arpad (Nicholas Barasch), a young delivery boy with higher aspirations. Overseeing them all is the firm but genial Mr. Maraczek (Byron Jennings). The show quickly becomes not so much a question of will they or won’t they get together, but when will they and how will they? Mr. Maraczek takes a paternal interest in Georg, urging the younger man to get out and start enjoying life. Apparently Maraczek was quite the lady’s man in his bachelor days, and Jennings’s wistful number “Days Gone By” is one of the show’s musical highlights. In actuality, Georg is indeed involved in a romance—though he hasn’t yet met the woman in question. The two have been carrying on a rather lengthy correspondence by mail, which began through a newspaper personal ad. Now they’re finally getting ready to meet at a local cafe. The spot is noted for its romantic and discrete atmosphere, to hear the Headwaiter (Peter Bartlett) tell it. First, however, Georg must deal with Amalia Balash (Laura Benanti). The new employee is the bane of his existence. She was recently hired over Georg’s objections, and the two have butted heads ever since over everything from cold cream to music boxes. Also poisoning the work atmosphere is Mr. Maraczek’s sudden coldness toward Georg, who cannot understand this change of attitude. Love changes those it touches. Eventually Georg heads for his long-awaited rendezvous, only to learn the girl of his dreams is none other than Amalia. This fact is not really a spoiler as her identity is revealed early on. The show quickly becomes not so much a question of will they or won’t they, but when will they and how will they? Georg continues to conceal his identity from Amalia, while getting to know her all over again, this time finding positive qualities he never saw before. His change in attitude causes Amalia to see him in a new light as well. Yet there is still the question of how she’ll react when she learns the secret he’s keeping. Finding love in unexpected places is the central theme to “She Loves Me,” as is the fact that love changes those it touches. A good example is how Georg experiences a feeling of giddiness when he realizes Amalia is truly in love with him and he with her. His outbursts of joy wonderfully come to the surface during his showstopping delivery of the title tune. It’s not only Georg and Amalia who start to see things with new eyes when love enters the picture. Ilona learns this truth when she meets a new beau, while also learning the difference between Mr. Right and Mr. Right Now. However, just as love can add joy to one’s life, it can also take it away. This sad realization occurs to more than one person in the story. While “She Love Me” was never intended to be a very deep show, there are times when its lack of depth hurts the production. Specifically, this happens in the relationship between Georg and Amalia, which is seen in small snapshots. Their final scene together has a rushed air to it, which leaves the viewer feeling somewhat cheated. All of the actors do a superb job with the various roles. McGrath gets the best laugh lines as Ladislav, while dispensing his pearls of worldly wisdom. Barasch as Arpad comes across as someone desperately earnest yet not quite annoying as he pleads his case to start moving up the company ladder. Creel does a great turn in a number where he attempts to woo back Ilona. The acrobatic way he moves about the stage is a testament to Warren Carlyle’s excellent choreography. Krakowski is very good as the sometimes ditzy blonde with a heart she doesn’t want broken; and Bartlett is funny as the Headwaiter who tries to maintain a facade of decorum at his job, despite whatever else is going on at the time. As for Levi and Benanti, both are quite appealing in their performances and each comes off as extremely likable. They play off each other quite well. 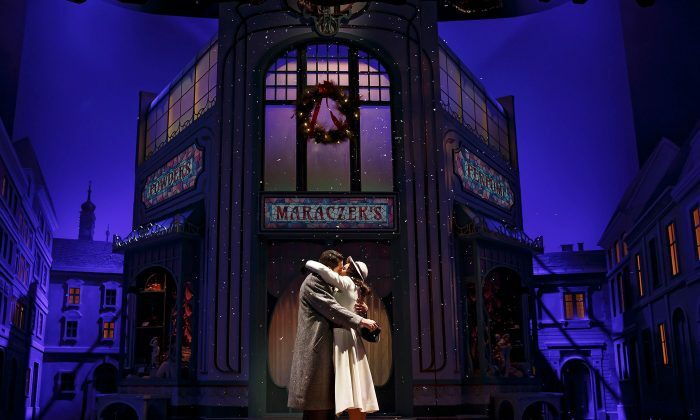 Despite its drawbacks, “She Loves Me,” with its book by Joe Masteroff, music by Jerry Bock, and lyrics by Sheldon Harnick, has at its heart an old-fashioned charm that’s wonderfully appealing. Also in the cast are Alison Cimmet, Cameron Adams, Laura Shoop, Jenifer Foote, Gina Ferrall, Jim Walton, Michael Fatica, Justin Bowen, Benjamin Eakeley, and Andrew Kober.